And he's now the biggest beast in Kielder Water and Forest Park! It's not every day your hero emerges from the pages of a fantasy book to have his face cleaned! 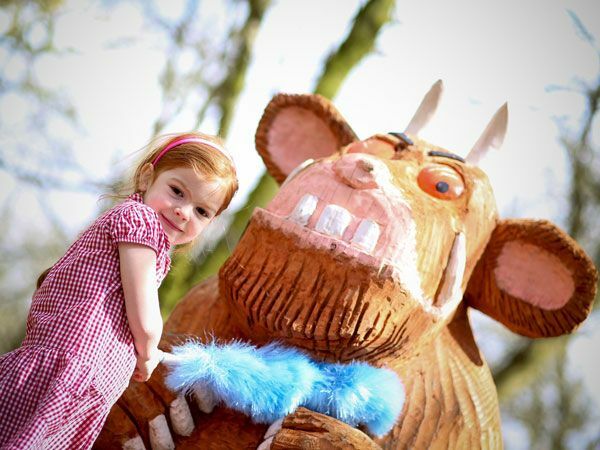 But supreme Gruffalo fans Chloe Lawson, 5, from Kielder First School, and her classmates were given the task of sprucing up a sculpture of the terrible beast before its unveiling in Kielder Water and Forest Park. Carved from timber, the saw-toothed figure is set to be a massive hit with youngsters in the 155,000 acre wilderness and has been joined by a smaller Gruffalo's Child, both fashioned by a chainsaw sculptor. Forest chiefs also hope the mythical animals will increase children's appreciation of the real thing. Illustrator Axel Scheffler visited the forest to help raise funds for red squirrel conservation and the Gruffalo's enduring appeal is so great that teachers at Kielder school often dress up as the iconic creature!